Oh, so nice! oh so nice! 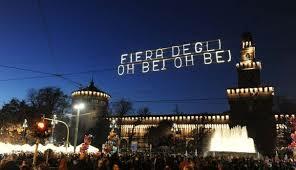 – The Christmas fair in Milan! 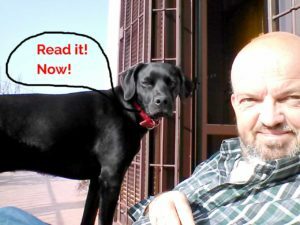 The festive month of december (Christmas!) starts early in Italy, not only in some regions in the North (see the post about San Nicolo) but in Milan as well. The day of the 7th of december is not only dedicated to the patron saint Ambrose (see the post about the Sant’Ambrogio basilisk) but also marks the start of the official opera season at the Scala and of the christmas market. The market is also called the Fiera di Sant’Ambrogio or „Oh bej oh bej!” So nice, so nice! This latter, weird name seems to originate from 500 years ago when a papal delegate entered the city handing out sweets to secure a happy welcome for himself. Nowadays sweets and winter delicacies still form a large part of what is sold on the market, apart from handicraft material to embellish your home for christmas. Apart from the chestnuts (‘roasted in an open fire’) there is the traditional Italian christmas cake, the panettone. 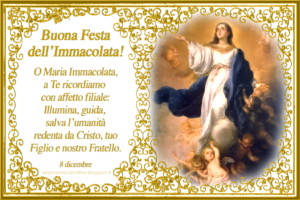 The market tends to be very crowded, also because the day after its opening is another feast, the national holday of the Immacolata, the immaculate conception of Maria. This means that many Italians often have a so-called ponte, a long weekend (either before or after the 8th of december. Nowadays the market is no longer held at the Sant’Ambrogio Basilica but near the Sforzesco castle. It lasts for a few days, how many depending on the year. 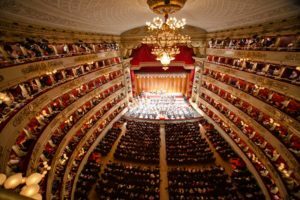 The Scala opera season always opens with the premiere of a classical piece out of Italian repertoire. The performance starts unusually early, at 6 p.m., probably to allow all the ‘nobility’ to have a nice dinner afterwards. That is, if it starts, because the syndacates of the opera personnel (not the singers) often threaten to go on strike at the premiere. This moment is their best opportunity of the whole year to get a salary raise! The premiere is a big media event, not only in Italy and has the status of the Oscars. It is the place to be if you are important (or if you think you are) and to be seen (or go and watch other celebrities). Do not think you can just go and walk in! Tickets are impossible to lay hands on and you need to wear the most expensive haute couture possible. Pay a visit to the Quadrilatero d’Oro first! Yesterday we went to a performance of La Cenerentola in the Fraschini theater of Pavia. 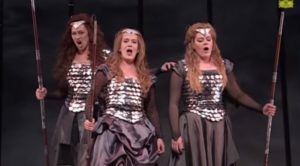 This Rossini opera (opera is called ’la lirica’ in Italy, as opposed to ’la prosa’, play) turned out to be a bit dull. The well-known fable did not offer much drama for the composer to attach his ever joyful arias to. But we enjoyed our evening nevertheless, as the singers were excellent and the theater itself is a feast for the eye. It seems that every, even the smallest town has its own Scala-type of theater. Pavia has the Fraschini, but the smaller village of Stradella has its Teatro Sociale which accommodates only a few hundred within its miniature Scala theater. Another theater of the same type we visited in the peasant town of Busseto where Verdi was born. Another Scala lookalike. One immediately feels at home in these cosy venues, the warm red velvet, the cream coloured balconies, the golden ornaments glittering in the dimmed honey-yellow light of the crystal chandeliers. When the central lights are spent, the boxes seem to be the loggias of apartments in palazzi that surround you. You feel you are in the square of a city on a summer evening. Italy! 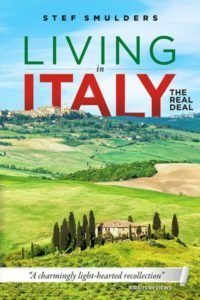 La dolce vita. Of course one immediately thinks of the Scala in Milan as the archetypical Italian opera theater, but maybe this is wrong. Wouldn’t the Fenice theater of Venice the real original model of all theaters, the Scala included? But even La Fenice wasn’t the first of this box-type theater, the San Carlo in Naples being the oldest still existing one. The box-architecture has a long tradition and Italians kept building these long after other countries like France opted for a more open style. Fortunately, as now you can (and should) go and see the local theater in every town you visit. The smaller the town the better. Buy a ticket for a performance, anything, as these are normally cheap, just to get the inside. 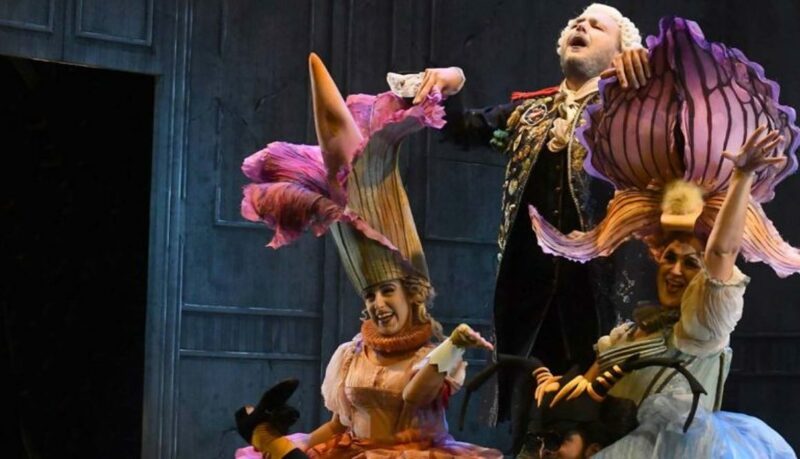 The theater seasons are a bit strange when compared to those of other countries as in Italy one starts with all the operas first, presenting all the plays afterwards, from February or so. No more opera after January! (major theaters like the Scala excluded). You should also visit a theater to watch the Italian public, how they behave and what they wear. La bella figura in ottima forma. A winter visit is special as in that season almost all Italian ladies wear fur, real fur, even inside the theater! Yesterday was the first cold day of the year and yes there they were! While we we dropped as much clothing as was still decent, temperature being somewhere near 23 degrees Celsius, the furs remained! Unbelievable. Italians and their health obsession. Triiiinnnng. The mobile phone right next to me went off. 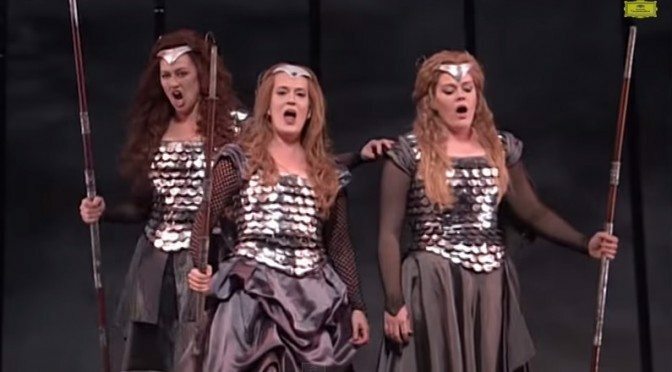 Oh no, I thought, Nico’s mobile phone, right in the middle of the performance of Wagner’s Die Walkure opera! And in one of the rare quiet moment of course and not during the Walkurenritt. Nico struggled to silence his phone with angry looking Milanese music lovers around him. And he never ever brings his phone (normally). Or if he does it is switched off, or has an empty battery. But now, of all occasions he has a functioning phone and someone tries to contact him. Which is a rare thing as well, as he never answers. 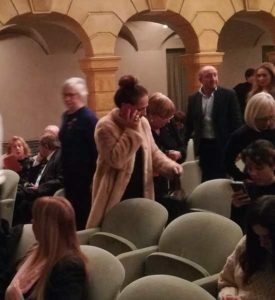 At the beginning of each performance the public is asked politely to switch of their phones, but of course the ones that should don’t listen… And we had two more evenings to go as we had booked the entire Ring cycle. Tickets which cost a fortune even with the 50% discount we were offered. Would they still allow us in tomorrow, after this humiliating incident? 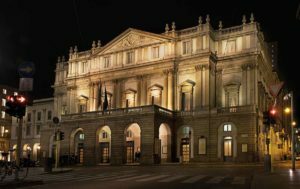 The world famous opera house Teatro alla Scala in Milan lies at the piazza that carries its name. It is situated at the northern end of the Galleria Vittorio Emanuele II shopping mall. The square offers a nice place to sit and watch the crowd, under the eye of Leonardo da Vinci ‘s statue. The facade of the Scala itself does not have much to offer, except during performance evenings when it is nicely illuminated. The interior is magnificent however, warm, cosy, intimate and beautifully decorated. All the independently lit boxes give it the impression of a little city. The Scala theater was completely renovated from 2002-2004. Seats now include monitors that present the opera libretti in English, Italian and the original language. La Scala’s season traditionally opens on 7 December, Saint Ambrose’s Day, the feast day of Milan’s patron saint. 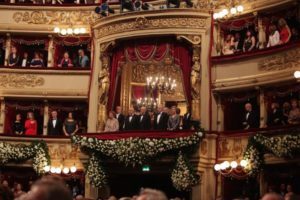 Tickets for opera performances are expensive and hard to lay hand on, although remaining tickets are sold on performance days. Show up at 13.00hr on the day of the performance and have your name put on a list, come back at 17:30. If they call your name you collect a number then wait till 18:30 to go in and buy your ticket. You may find it easier to get tickets for other performances than opera though. Have a look at the recitals or smaller scale concerts. Another option is to take a tour from the Museo Teatrale alla Scala and have a peek in the (empty) theater. Information on seating availability and guidelines for purchasing subscriptions and tickets: tel +39 0272003744 every day from 9 -6. There is also a Central Box Office, in the Duomo Metro station. Open every day from 12-6. Completely accessible to the disabled (but no parking). 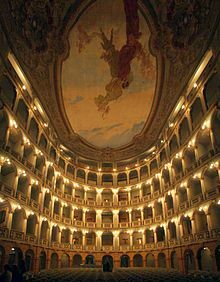 A bite of Italian: the name La Scala originates from the Veronese Della Scala family that founded a church, later demolished, on the location of the theater.